Be part of the SCHLOSS. Dear Visitors and Guests, welcome to the SCHLOSS. Set in the beautiful Scottish Borders, this historic property features a 20-bedroom luxury hotel, a championship golf course and a full range of sporting pursuits on the Estate. The estate offers a getaway destination little more than an hour’s drive from both Edinburgh and Newcastle. Formerly owned by the Duke of Roxburghe, the hotel, golf club and a portion of the grounds have been recently acquired by the 12.18. group. The charming country house has been enhanced by an extensive and tasteful refurbishment with further plans for a separate extension to feature 57 additional rooms, a luxurious spa and state-of-the-art meeting space. In addition, 60 lodges will be built on the surrounding estate, further extending the room inventory of the new SCHLOSS Roxburghe. Here, in the peaceful, natural surroundings of the Scottish Borders, leave everyday life behind you and find time to connect with your true self. Recharge your batteries in an exclusive environment and experience unforgettable moments in style and luxury. Finally, let us look after you while you indulge in the exceptional culinary offerings, created wherever possible with fresh produce from our very own gardens. Elegance and excellence for every type of taste. The idyllic natural surroundings at SCHLOSS Roxburghe invites you not just to relax, but also to go outside and get active. After all, there is nothing better than testing your physical limits, trying out new and unknown things, and restoring the soul. There are numerous possibilities offered on site, from the Championship Golf Course, to our very own trout pond and fishing beat, not to mention the Roxburghe Shooting School that offers a range of activities including archery, tomahawk throwing and clay pigeon shooting. Within the grounds of SCHLOSS Roxburghe, you will find the Roxburghe Championship Golf Course. For people who want to stretch their physical and mental capacities, golf is the perfect activity. A round on the golf course strengthens the muscles, psyche and the immune system. 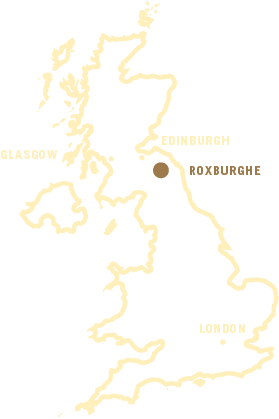 The Roxburghe Championship Golf Course was opened in 1997, the work of renowned golf course architect Dave Thomas. The design bears his hallmarks of well-positioned bunkers and large, USGA rolling greens. The only championship-standard 18-hole course in the Scottish Borders will challenge the best while giving pleasure to all. This 7,100 yard, 72-par course follows natural contours, mature beech woods, dramatic water hazards, and uses clever bunkering to spectacular effect making this a "must play" venue.